Do you love Snickerdoodles? 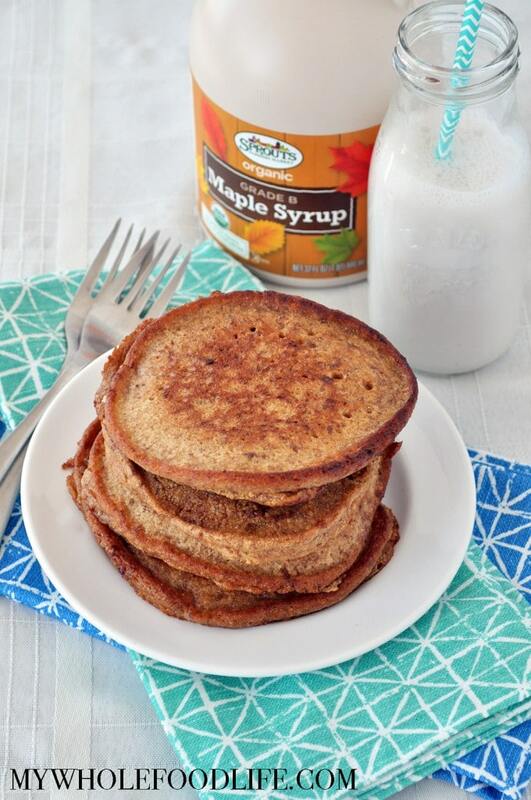 If so, you will love these kid friendly Snickerdoodle Pancakes! These pancakes aren’t just kid friendly, they come with a boost of protein and fiber thanks to a special ingredient. The special ingredient in these healthy pancakes is chickpea flour. Chickpeas fall under the term pulses. Other foods in the pulse category are: lentils, beans and peas. Did you know that the UN declared 2016 the International Year of the Pulses? You may ask, why does the UN care about pulses? Let me tell you all about it! If you want more delicious pulse recipes check out my Lentil, Sweet Potato and Squash Soup, White Bean Salad and my Flourless Blondies! So go out and experiment with pulses, and please consider taking the pulse pledge to eat more pulses in 2016! The perfect kid friendly breakfast! Mix the cinnamon/sugar topping in a small bowl and set aside. n a large bowl , mix all the dry ingredients and stir well. Slowly, a little at a time, add water until you get a thicker pancake batter consistency. Start with 1/4 cup and work your way up. If you want to make more of a crepe, you can add extra water to thin it out more. Heat a saute pan on medium heat. Add a little bit of oil to the pan. Using a 1/3 cup measuring scoop, add batter to the pan. Sprinkle a little of the cinnamon/sugar topping on top of the pancake. Very much like regular pancakes, these will start to bubble a little once they are ready to be flipped. Repeat these steps until all the pancakes are done. These pancakes should last at least 4 days in the fridge. You can also freeze them for longer storage. Enjoy! These look great! I never have chickpea flour handy. Could I use an ap gluten free flour or sorghum or millet? Thanks! I am sure gluten free ap would work too. Wow - I love all the 'non traditional' pulse recipes! And this one is no exception!